Need dental fillings in the Vancouver, WA area? Dr. Bowyer has you covered. This dental service replaces missing tooth structure due to basic cavities. Dr. Bowyer uses composite, tooth-colored fillings so that your dental work blends in with your natural tooth color. The filling material comes in a variety of colors and will be professionally matched to your teeth. During the procedure, Dr. Bowyer will remove any decayed tooth material, clean the tooth, and fill in the cavity with the composite filling material. Fillings prevent further tooth decay by sealing off open cavities where bacteria can enter. 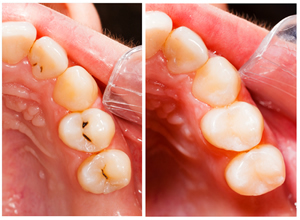 It’s best to address cavities as soon as possible with fillings so that they don’t get worse. Most dental filling procedures can be completed in one office visit. For larger cavities or fractured teeth, Dr. Bowyer may recommend a dental crown or cap instead of a filling. Contact Dr. Bowyer today at (360) 253-2640 or use the form to set up a free consultation!